Looking for photo deleted recovery software to get back deleted photos? How to get back deleted photos? This tutorial provides the best free photo recovery software and explains how to recover deleted, lost or formatted photos, images and pictures from various storage devices. It is not easy to avoid accidental deleting of important files, and we should know the method to get them back. Free download the powerful recovery program and get back deleted photos now. DiskGenius - Best photo data recovery software to get back deleted or lost photos, pictures and images. How to recover my deleted photos with photo deleted recovery software? When do you need photo deleted recovery software? It is terrible to lose important photos which haven't been backed up, and yet luckily photo data recovery can recuse lost photos. Photos have special value to their owners, for they might record a family vacation, a perfect posed selfie, children's growth, working materials, etc. Digital camera and smartphones revolutionized our ability to take photos and videos, which makes it extremely easy for all users to take photos. It is common to store hundreds of photos on computers, phones or other devices, but only part of users have the habit of backing up data regularly. Thus, photo loss issue often happens. Like other types of files, photos stored on storage media can get lost due to all kind of reasons such as accidental deletion, formatting, file system corruption, virus attack, device damage, system crash, etc. Moreover, photo loss issue can appear on all storage devices for example, hard drive, digital camera, memory card, USB flash drive, virtual disk, external hard drive, etc. Fortunately, in most cases, deleted photos can be recovered with the help of correct software. Why deleted photo recovery is available? How does photo deleted recovery software work? Deleted photos are recoverable, which should thanks to the way system stores and deletes data. When a photo gets deleted from SD card or other device, only the link to the photo is removed instead of the actual data. You can understand it in this way: you delete an item from the contents of a book, but the actual corresponding chapter is still kept. Photo recovery program does not count on the link and it is able to read all content of the book and then find the correct chapter for you. There are too many photo recovery programs that can help you get back deleted and lost digital photos, but there is not 100 percent guarantee all photo recovery task will work. The following section talks about photo recovery software, which helps to choose correct recovery application to solve your problem. When it comes to photo deleted recovery software, you might feel at sea, for there are too many similar recovery programs on the market. Here we recommend taking into consideration five basic aspects when choosing photo recovery software: function, efficiency, security, compatibility and technical support. The recovery software should be effective and functional when tackling data loss issue; the recovery process should be read-only, which does not cause any write operation to original data; it should be compatible with various file system types and Windows version; the technical support should be professional and swift. We've tested a couple of photo recovery applications and here are two recommended programs. Eassos Photo Recovery is the perfect choice for novice users who are not expertized in computer skills and data recovery task. It is designed with a clean and user-friendly interface which guides through the recovery process. Eassos Photo Recovery is read-only when recovering deleted or lost photos/pictures/images; the scanning process is quick and effective, and it is able to ignore file system to identify underlying data. The limitation on this tool is that it is capable of recovering photos only, thus you need to use other software if you also want to recover videos, music, documents, apps, etc. In many cases, data recovery cannot achieve 100% success rate due to the reason that some lost files get overwritten. Since data recovery technic cannot get back any overwritten deleted data, we should protect lost photos against overwriting before we get them back successfully. The first thing you should note is that stop using the device immediately when you realize you need to recover lost photos from it. For example, when you come to know you need to recover photos from SD card which is placed in digital camera, you should stop taking any pictures or videos any more, or lost data will be overwritten. Then connect the storage device to computer and start recovery at once. The following part will show you how to recover my deleted photos with photo deleted recovery software. 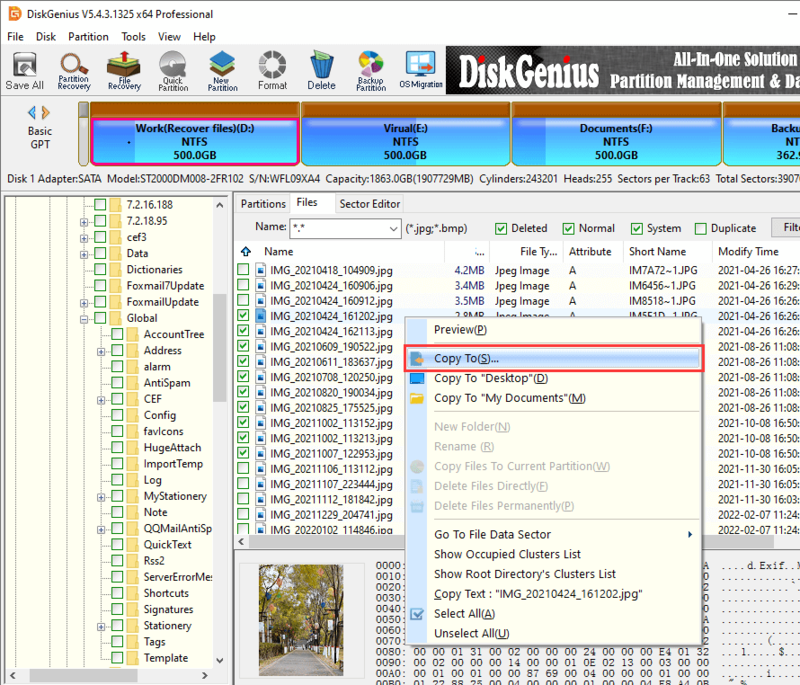 Step 1 In DiskGenius, right-click on the partition where lost photos are stored and click Recover Lost Files. 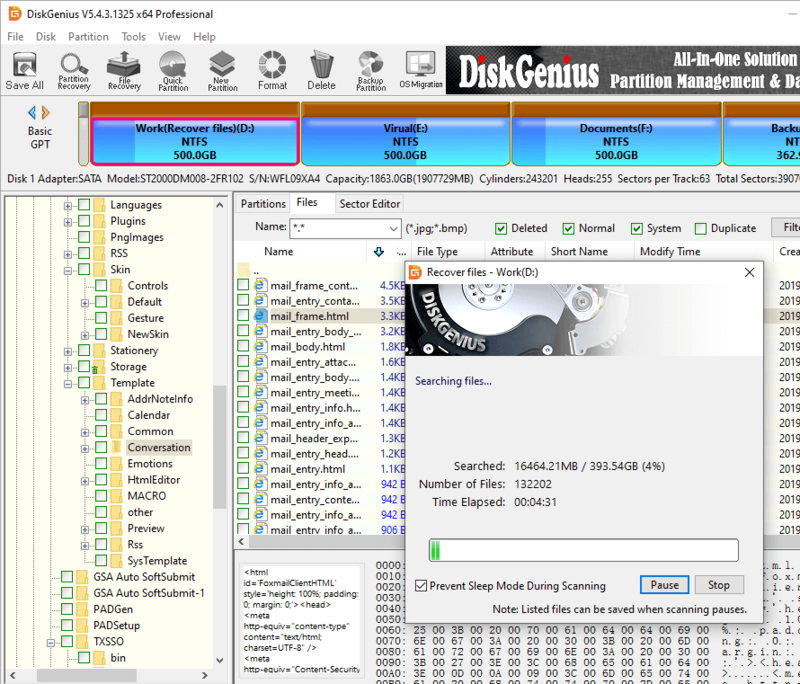 Launch DiskGenius from your Windows computer and you can view all disks and partitions on the computer. Then you can easily locate the drive from which you need to recover deleted or lost photos. Step 2 Choose recovery mode and click Start button to let the software look for recoverable photos. 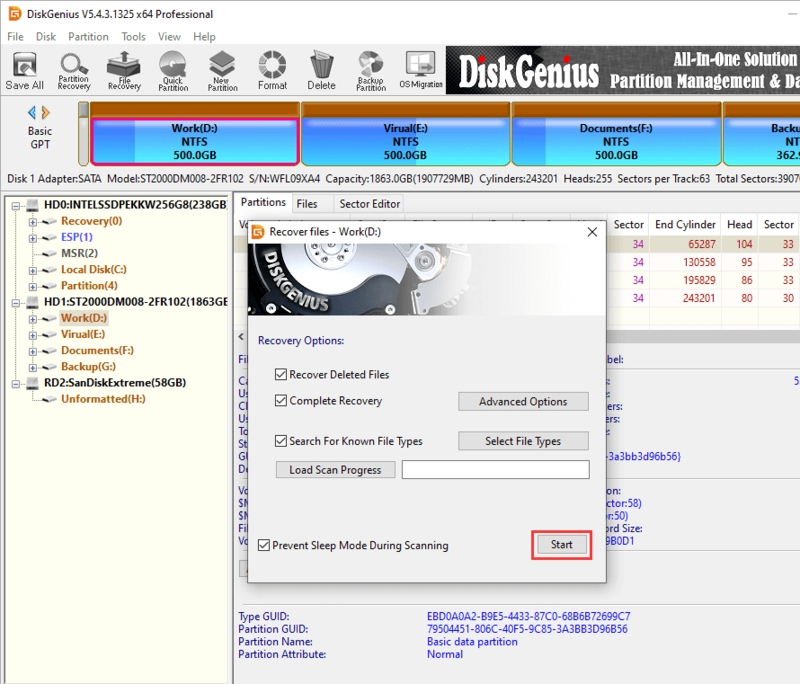 DiskGenius provides two recovery options: Recover Deleted Files and Complete Recovery, and you can choose both so as to it can find out as many files as possible. 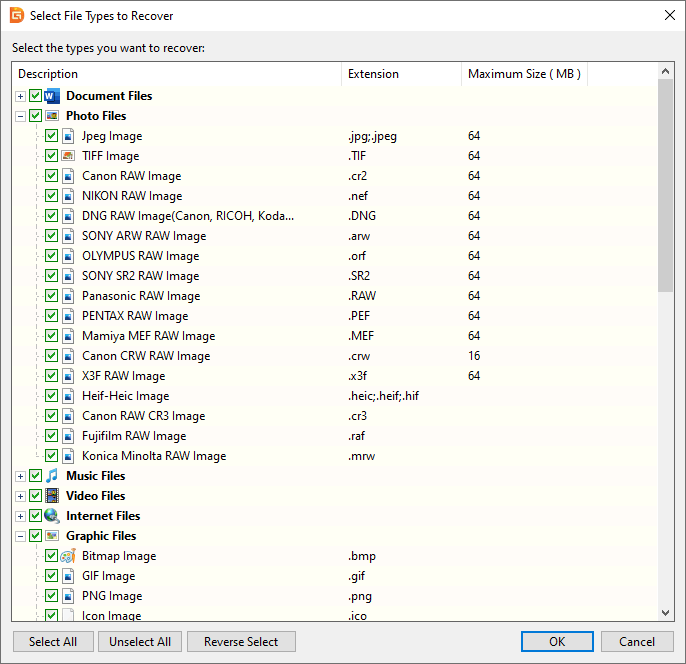 Search For Known File Types is the option of deep scanning which scans data without considering file system and recognizes file data directly; this option is very helpful if file system gets damaged or lost files get partly overwritten. You can click Select File Types button to choose file types you want to recover, as below. On the pop-up window, you can select file types under Photo Files and Graphic Files to recover photos and pictures. If you also want to recover deleted or lost videos, you can expand Video Files and choose desired types. 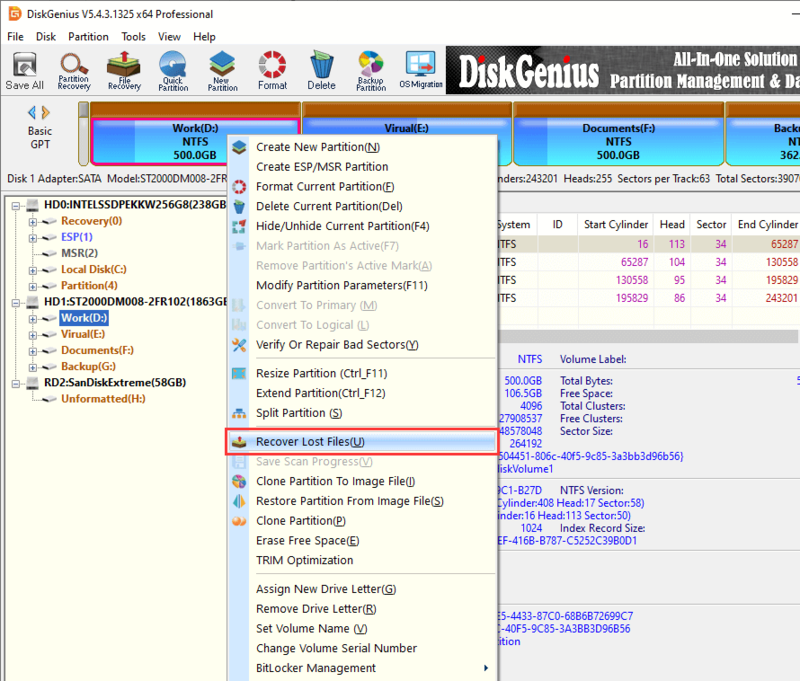 DiskGenius is scanning selected drive, as follows. It lists lost files and keeps updating scanning result as scanning process goes on. Now you can preview listed files and check if they are correct. Double click a file and you can open it in previewing window, and the following screenshot shows DiskGenius is previewing .jpg file. This software provides effective file preview function which supports to preview photos, music, video, MS office files, PDF file, text file, etc. By way of previewing files, you can easily and accurately find out what you need and check whether files are corrupted prior to actual recovery. Step 4 Recover photos you need. When scanning process pauses or stops, you can copy and save files to get photos recovered. Select files and folders you want to restore and right-click them to choose Copy To. After that you can set a location to save recovered photos. So much about the recovery process and you can perform photo recovery whenever you need. Though deleted photo recovery is easy, there is no guarantee the recovery can be achieved successfully all the time, for overwritten data cannot be recovered by any method. Hence, we should pay attention to ways to prevent data loss, for instance, back up photos regularly and keep several backup copies on difference disks; use qualified storage devices and buy them from known manufacturers. Delete photos from Recycle Bin or empty Recycle Bin: You delete photos from computer and deleted files will be removed to Recycle Bin. These deleted files can be restored directly without any recovery tool as long as you can find these photos in Recycle Bin. However, if you delete files from Recycle Bin or empty it, then you cannot restore them in this way. In this case, photo recovery program will come to the rescue. Delete photos using Shift + Delete keys: Files deleted by Shift + Delete keys won't be put into Recycle Bin and they will be deleted directly. Since the deleting bypasses Recycle Bin, there is no way to restore them from Recycle Bin and you need to do photo recovery to get back deleted pictures. Photos gets deleted from external storage device: If you accidentally delete photos from external devices such as SD card, USB flash drive, deleted photos won't go into Recycle Bin. Therefore, if you want to get back deleted photos then you need photo data recovery software. Photos are deleted from camera or smartphone: Storage space on digital camera or smartphone is limited, and you may click Delete option to remove files in order to free up disk space. During deleting operation, it is likely to deleted important photos by mistake. In this situation, deleted photo recovery software is needed to restore images. Photos get lost during Cut & Paste: Sometimes Cut & Paste does not work as expected, and the process might fail due to system errors, power issue, application bug, etc. The result is data loss and you need to undelete files with recovery software if lost data does not have backup copy. After reading this tutorial about photo deleted recovery software, you may become able to retrieve deleted photos from all types of devices via simple and effective steps. Recovering deleted photos or restoring lost photos is useful technic and it should be acquired by all of us. Apart from learning using photos recovery software, we should also attach importance to photo backup which helps a lot when preventing data loss issue. If you have other solutions or need any help, please do not hesitate to contact us. We'd love to hear your opinions on our products and services. 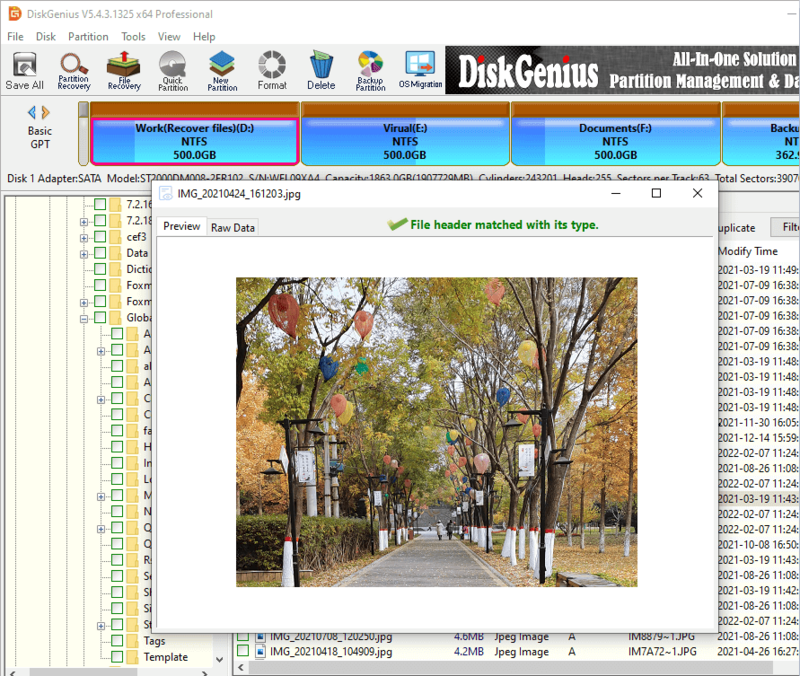 DiskGenius - Leading photo recovery software for HDD, SD card, USB disk, digital camera, ped drive, etc.